Outside lighting should be reduced and on the warning of aircraft approaching all should be extinguished for the rest of the night. The news of these ‘outrages’ spread and many people were afraid that this new danger might effect them and their homes. Most towns in Wiltshire reduced their street lighting (mainly gas lights) by reducing the number of lamps lit and by putting dark paint on the others to restrict the light to shine down only. After air raids on the Midlands during January 1916 the Home Office Restriction of Lighting Order came into force on 8 February for the whole of the U.K. except for the 6 westernmost counties. This limited street lighting to those lamps judged necessary for public safety by the police and introduced restrictions on private & shop lighting – to prevent no more other than a dull subdued light to be visible from outside. Contravention of the Order carried maximum penalties of a £200 fine or six months imprisonment, however most Wiltshire Magistrates limited fines to 10 shillings. The dark streets caused many accidents, particularly on moonless nights. There was also dissatisfaction that Wiltshire towns had to obscure lights earlier than Bath, Gloucester, Cardiff or Plymouth. The restrictions remained in place until the end of the war. ACCIDENT TO MR. NORMAN RATCLIFFE. With no ordinary regret we record a painful accident to one of Malmesbury’s most respected townsmen. Mr. Norman Ratcliffe – without exaggeration, a household name in Malmesbury and the neighbourhood. It is unnecessary to add that he is a chemist – that designation inadequately describes what he has been, is, and we hope will long be, to the population of the borough; the family doctor would be a far more appropriate title, for to him we may say, without fear of contradiction, nearly everyone goes for advice – and in writing this no reflection is intended on the medical profession. It was the density of the darkness of Malmesbury’s streets – so vividly pictured by Alderman Farrant at last week’s meeting of the Town Council – which caused Mr. Ratcliffe’s accident. 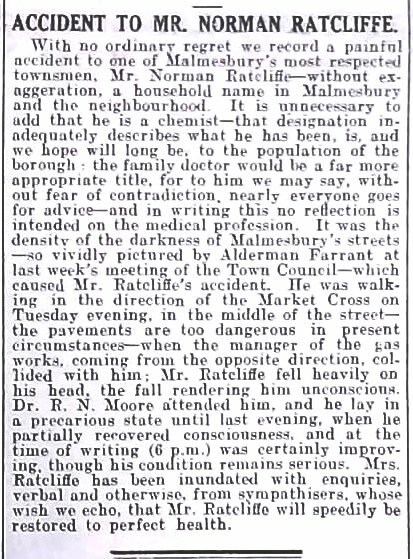 He was walking in the direction of the Market Cross on Tuesday evening, in the middle of the street – the pavements are too dangerous in present circumstances – when the manager of the gas works, coming from the opposite direction, collided with him; Mr. Ratcliffe fell heavily on his head, the fall rendering him unconscious. Dr. R. N. Moore attended him, and he lay in a precarious state until last evening, when he partially recovered consciousness, and at the time of writing (6 p.m.) was certainly improving, though his condition remains serious. Mrs. Ratcliffe has been inundated with enquiries, verbal and otherwise, from sympathisers, who’s wish we echo, that Mr. Ratcliffe will speedily be restored to perfect health.